When the designers at Axial Racing set out to build the Wraith, they wanted to deliver the ultimate RC experience with all the best components. This philosophy was employed throughout the design process all the way down to each detail, including its one-of-a-kind seat selection. The Corbeau LG1 racing seat is at the top of the list for any full-size truck or car builder. The folks at Corbeau have even stated that, "Its unique curves and contours re-define comfort." Whether on the street, track, or off-road, the LG1 racing seat will enhance your overall driving experience." Axial is a firm believer in delivering only the best for their clients, and are proud to offer the 1/10 scale officially licensed Corbeau LG1 racing seats. These seats will be a great compliment to any custom build, and will allow the builder an opportunity to showcase their desire for the most realistic and highest quality product on the market. 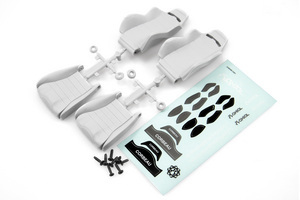 The Axial/Corbeau LG1 scale seats are fully functional with a unique to the market reclining ability. This offers you some options when mounting them in tight quarters. The seats are available in black or gray and are sold in a set of two.